An original, early 20th century Impressionist marine oil on panel by the Irish listed artist Thomas Carr RUA, RWS. He exhibited in galleries and major Irish and British art institutions. He was noted for his landscapes and seascapes in Scotland. This large and impressive impressionist work was painted in 1917. 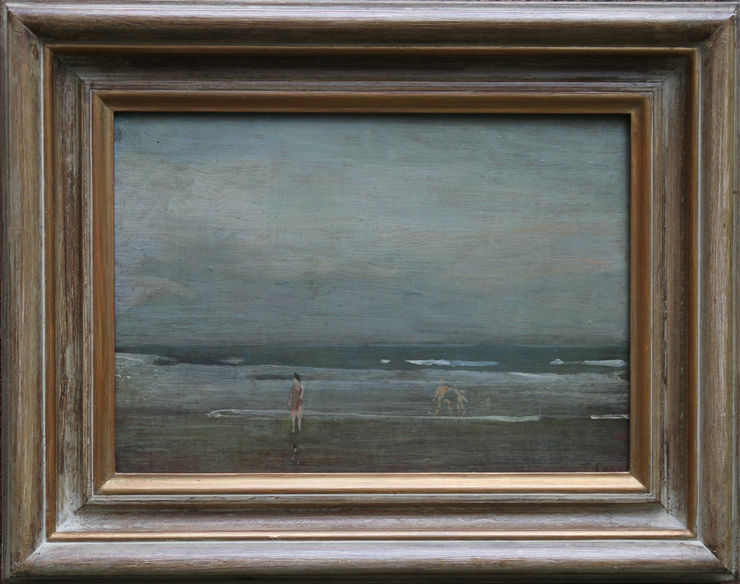 Early 20th century Irish seascapes like this can be seen on display at Galleries and art fairs. This is a very good example of his work. It is a good size and signed with good provenance. A lovely painting housed in a fine frame. Leicester Galleries 1942, Ernest Brown and Phillips. Lord Howard de Waldren. Fine frame which compliments the picture. 20 inches by 16 inches. Thomas James Carr RUA, RWS (1909-1999) - was one of Ulster's leading artists of the twentieth century, admired especially for his portrayal of landscapes and figures. Although he painted in oils, "watercolour painting and Tom Carr are inseparably associated", in the words of another great Irish landscape painter, TP Flanagan. Explaining the difference, he said that he regarded watercolour painting as a "direct medium": once you have committed something to canvas it cannot easily be changed. Oils, by contrast can more easily be worked at, fashioned and altered. He was born at 16 Deramore Drive, south Belfast, son of a stockbroker father; his mother came from the Workman family, of Workman Clark, one of Belfast's most prominent shipbuilders. A cousin was Howard Ferguson, the musician. His grandfather Workman was a keen amateur painter and gifted the young Tom his first set of watercolour paints. Tom started the study of painting as early as kindergarten in Windsor Avenue, Belfast, and when older went on sketching and drawing outings with his painter grandfather. He attended Inchmarlo, the preparatory department of the Royal Belfast Academical Institution, which was a matter of minutes away across the Malone Road. At 13 he went to Oundle School, Northamptonshire, England, one of the oldest (1556) and distinguished in the country though Carr is said to have disliked it. Nevertheless, after instruction there under Edward Montgomery O'Rorke Dickey, a fellow Ulsterman and himself an accomplished painter, wood engraver and illustrator, and the portraitist Christopher Perkins, he continued to the Slade School of Art in London, where he studied for two years (1927-1929). At Slade, two fellow pupils and fellow Ulstermen were F.E. McWilliam, the sculptor, and John Luke, the painter. Also in London were Ulster artists James Warwick, Mercy Hunter and George McCann, at the Royal College of Art. Carr would later recall Irish song-sessions on London buses. One of his teachers was Henry Tonks, who was seen by many as a formidable figure and exacting teacher; Carr liked Tonks personally and learned from him the importance of the highest standards of draughtsmanship, especially regarding shape, form and structure (Tonks had earlier been a plastic surgeon). Flanagan differentiated Tonks approach from Carr's, writing that Carr, who had always aimed at landscape painting, preferred to emphasise tone, light and shade when evoking form. This was sometimes called a "painterly" approach, as preferred by Walter Sickert. Carr admired Sickert, calling him the greatest painter of his generation and "way beyond our reach". He also admired Degas, a friend of Sickert. After Slade, he spent several months in Italy, where thanks to arrangements made by Tonks, he was able to stay in the villa of the American art collector and critic Bernard Berenson, where he enjoyed the large number of artworks. He then returned to London. Some of his work was displayed at the "objective abstraction" exhibition at the modern art Zwemmer Gallery, London in 1934. Objective abstraction was "a non-geometric form of abstract art in which the painting evolved in an improvisatory way from freely applied brushstrokes"; this was not really Carr's style and later he described it quite scathingly ("rubbish") and related that he used some canvases to repair the roof of his beehive. He preferred the traditional realism of the Euston Road School (more a club of like-minded artists; it offered no qualifications) and some of his work was exhibited at the Storran Gallery. His instinct leant towards "pictorial autonomy". He returned to Northern Ireland at the beginning of the war in 1939 and settled in Newcastle, County Down. In the war years he did some work as a war artist, painting parachute makers and military aircraft (the Short Sunderland flying boat), but also much time walking round the local countryside which he would later depict in his celebrated landscapes. Carr was also a portrait painter of distinction; much of this part of his work remains in private hands, as being painted to private commission. However, in terms of exhibitions, after his first one-man exhibition in 1935, there followed 15 such exhibitions up until 1980 and his work was to be found in collections of the Arts Council of Great Britain, the Tate Gallery, The Victoria and Albert Museum, the personal collection of Queen Elizabeth the Queen Mother, the Phillips Collection in Washington DC, and the Ulster Museum, as well as many others. One work, a watercolour "Nettle Bed snow", was hung in the Oireachtas, the Irish Parliament in Dublin, for which he was given a special prize. He spent most of the rest of his long life simply painting, although he also taught, mostly at Belfast College of Art. His preferred daily routine was to be early in his studio, where he would spend most of the day - not all; neighbours in Malone Hill Park Belfast still recall him walking one of his dogs past the pillar marking the City boundary, on his way towards Shaw's Bridge. He was a quiet, private man, though given to pithy retorts such as, when asked if he found painting hard work, he replied that it was, but not as hard as cutting grass. He was awarded an honorary doctorate from Queen's University, Belfast, appointed MBE in 1974, OBE in 1993, and an honorary member of the Royal Hibernian Association. In 1971, a set of special stamps was issued to mark the "Ulster ‘71" Exhibition, one of which featured a Carr painting. In 1983, a major retrospective was mounted at the Ulster Museum, Belfast, which moved to the Douglas Hyde Gallery, Dublin in 1984; 160 of his paintings were featured. In 1995 he moved to Norfolk to be near his daughter, Ann, who wrote culinary books which were published with illustrations by her artist husband, Martin MacKeown. 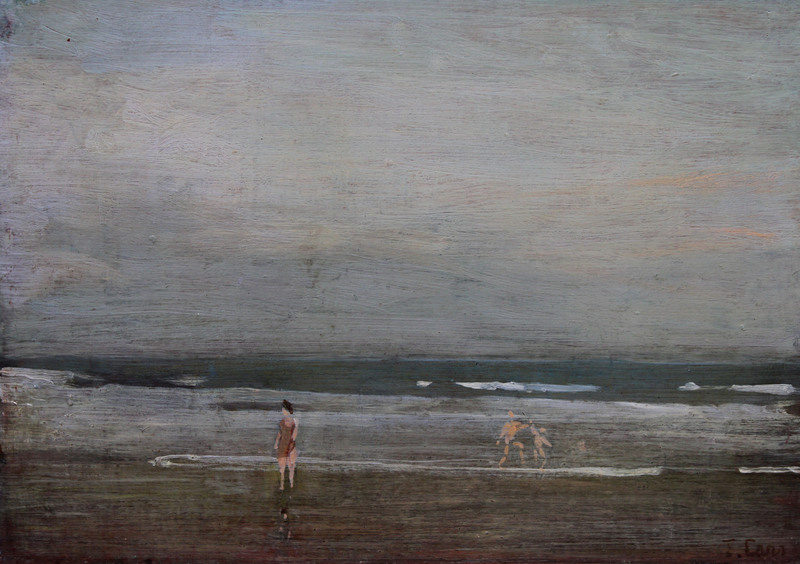 Carr, though, continued painting, with new landscapes as models and a daily walking schedule, as in Belfast. In 1996 the BBC made a film about him, "Sunshine in a Room". He died at West Norfolk Hospital, Norwich.